On this day in 1948, the United Nations adopted the Universal Declaration of Human Rights. To celebrate the anniversary of this historic text and the principles it proclaims, several leaders in the human rights field gave a panel presentation today at COP15. Panelists included Martin Wagner of Earthjustice and Ulrich Holstein of the U.N. Human Rights Council, as well as distinguished speakers from the Seychelles, Kenya, and the Inuit people of Canada. They each emphasized the vital importance of taking human rights into account during the climate change negotiations. The panelists explained that emissions reductions targets are inherently a human rights issue because anything over 1.5 degrees and 350 ppm condemns entire nations to devastating consequences and, in many cases, complete disappearance. They also pointed out that the rights of peoples displaced by rising sea levels and other climate effects have not been part of the discussion until very recently. Yet the issues relating to refugee status, relocation, land rights, and sovereignty are extraordinarily complex and will need many talented legal minds to resolve. The panelists also noted that, for the first time in March 2009, the UN Commission for Human Rights unequivocally affirmed the devastating consequences of climate for human rights in Resolution 10-4. Climate change can have tremendous impacts on many of the fundamental and inalienable rights recognized by the international community, including the rights of people to food, water, shelter, means of subsistence, culture, and participation in decisionmaking. According to Mark Wagner, the policy makers and NGOs discussing climate change often get lost in the facts and figures, and it is important to remind people of the very real and tragic effects on human beings that are already occurring. In his words, “if science and law are the ‘mind’ of climate change, then human rights is the ‘heart’ of climate change.” The panelists acknowledged that human rights are very difficult to protect and enforce, especially in the international arena. Each of them also lamented the “woefully inadequate” proposals for funding from developed countries to address the adapation needs of the most vulnerable low-lying islands, coastal nations, and very poor countries. Nevertheless, they were encouraged to see so many youth attending the conference, and they were hopeful that the parties could make some progress on both climate change and human rights during this conference. Are Human Rights Lost and Damaged? This entry was posted in Adaptation, African Group, AOSIS, human rights, LDC Group, NGOs and tagged anniversary, climate change, displaced, fundamental, human rights, refugee, universal declaration, woefully inadequate. Bookmark the permalink. 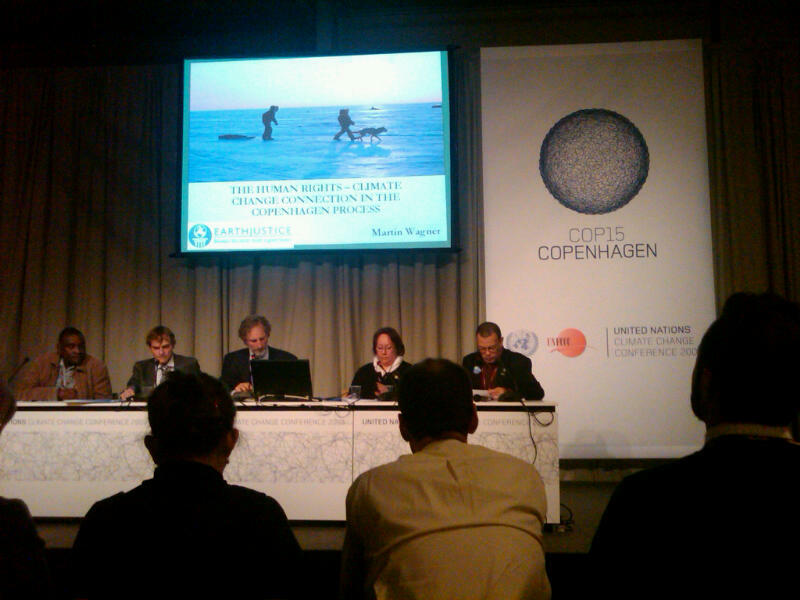 ← Our Own Tracy Bach Presenting at COP15!